Thanks to Dr. Zainab Harb, MB BCh BAO, Salmaniya Medical Complex, (Bahrain) for contributing this case and Dr. Raul S. Gonzalez, Assistant Professor, University of Rochester Medical Center, New York (USA) for editing the discussion. To contribute a Case of the Week, first make sure that we are currently accepting cases, then follow the guidelines on our main Case of the Week page. (1) PathologyOutlines and Dr. Pernick will be at CAP17 Meeting, October 8 - 10, 2017. Come visit us at booth #215. (2) Did you know that we have a page devoted to posting Continuing Medical Education (CME) courses? We list CME courses, which often provide SAM, related to Pathology or Laboratory Medicine. You can search by recently posted CME or by subspecialty. Please visit our page here. 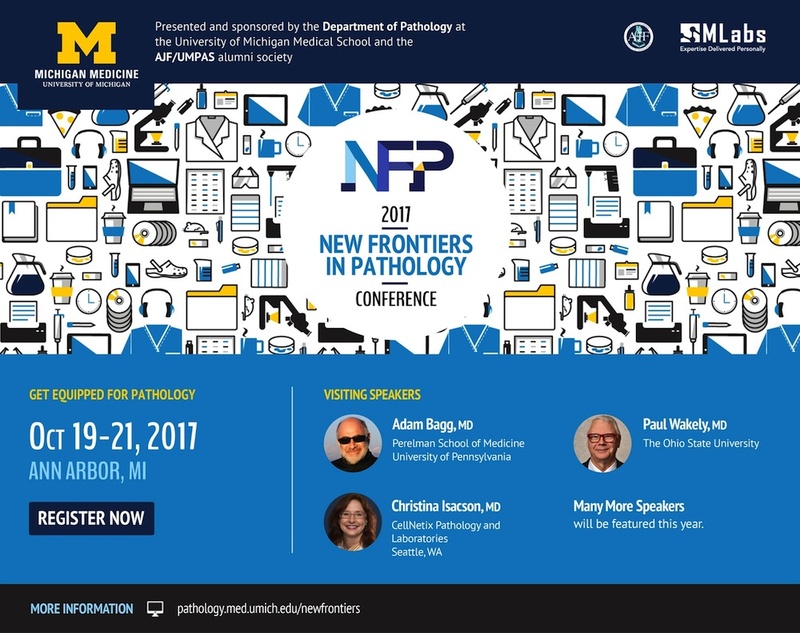 (3) Make sure you receive our What's New in Pathology newsletters, too. If you don't, you can sign up here, as well as view the six issues already posted. 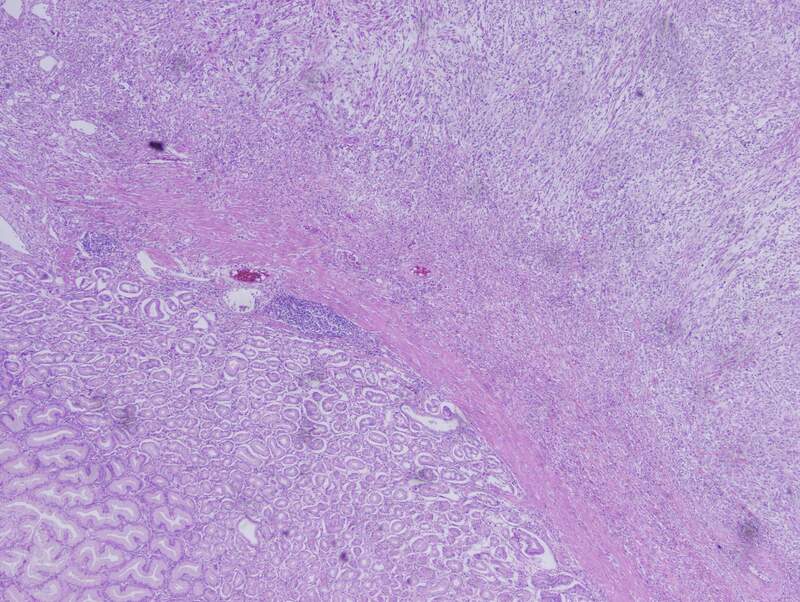 A 50 year old woman with hypertension and diabetes presented with a submucosal gastric mass. Subtotal gastrectomy was done. 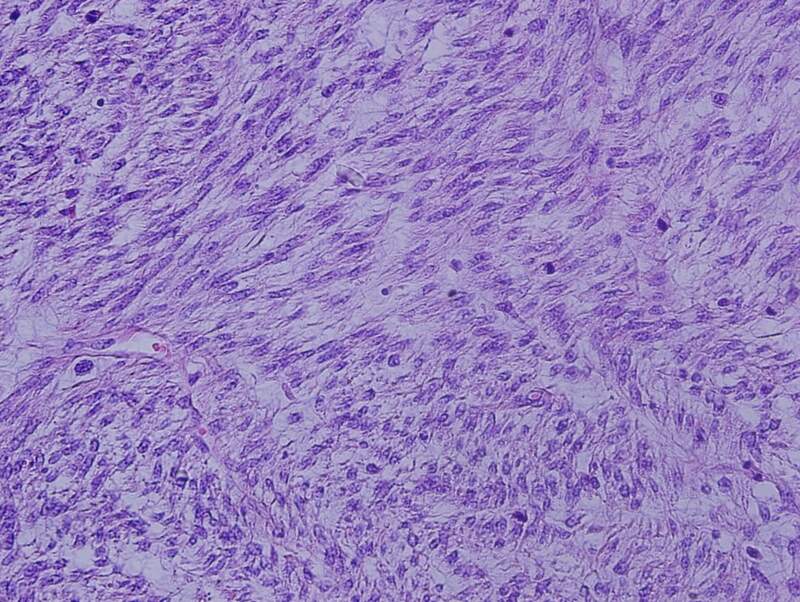 Histologic sections show a high grade spindle cell tumor in the gastric submucosa infiltrating into the overlying mucosa. 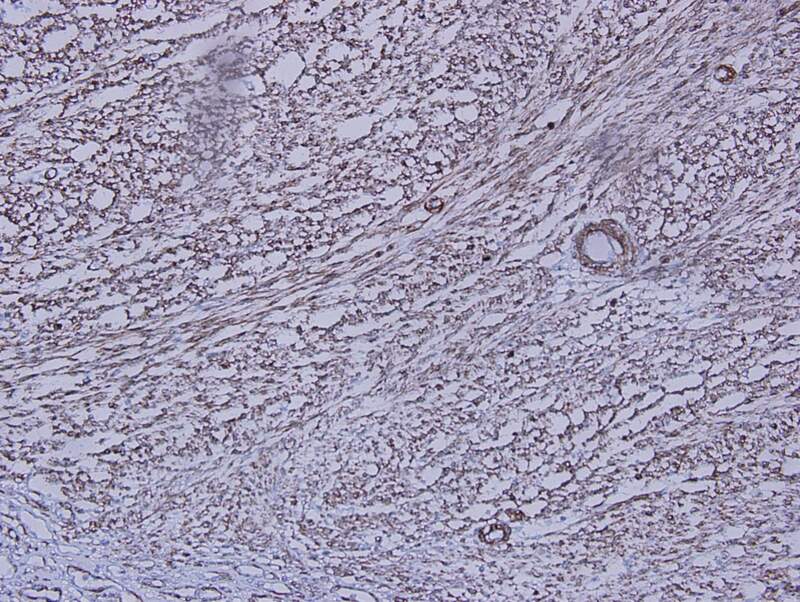 The tumor is composed of spindle cells arranged in fascicles with focal whorl formation. 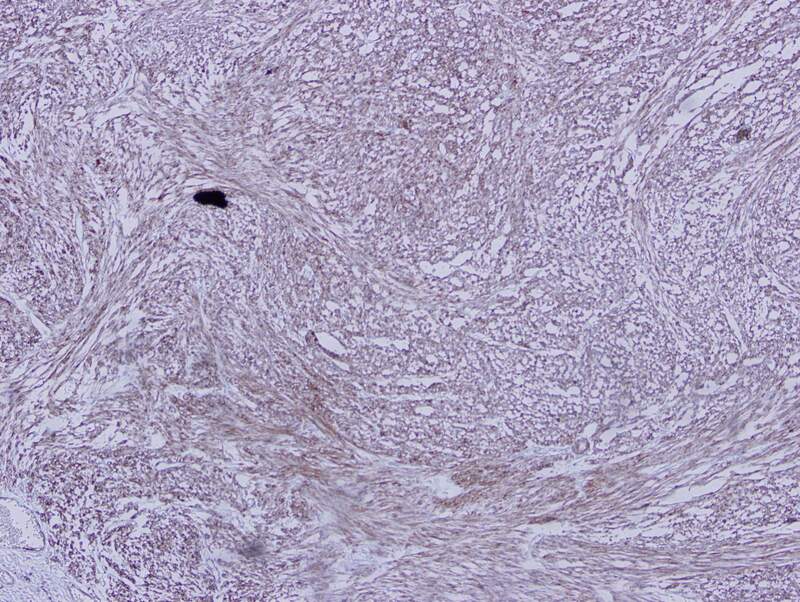 Neoplastic cells show plump to oval nuclei with mild to moderate pleomorphism and frequent mitoses (65 - 70/10 HPF). Foci of necrosis and calcification are also observed. 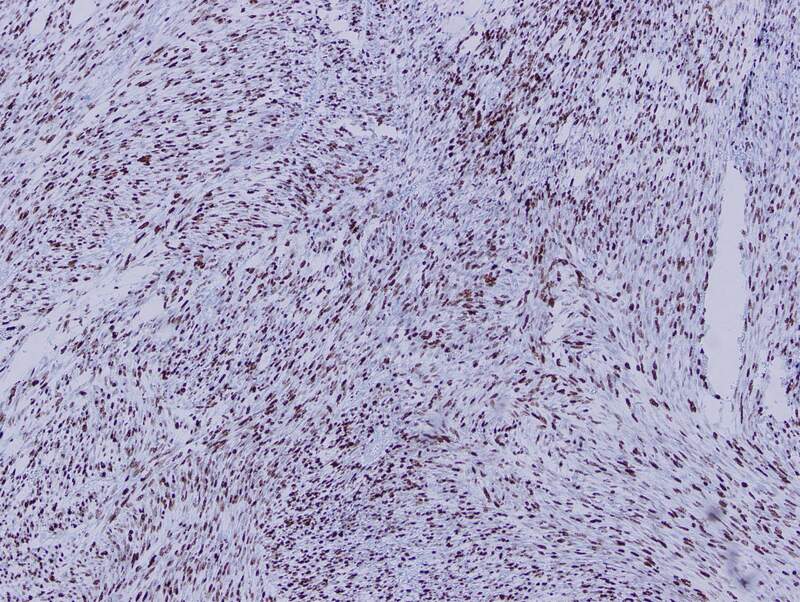 The tumor cells are negative for DOG1, KIT and CD34, diffusely positive for SMA and MSA, and focally positive for Desmin. Ki67 was ~70%. 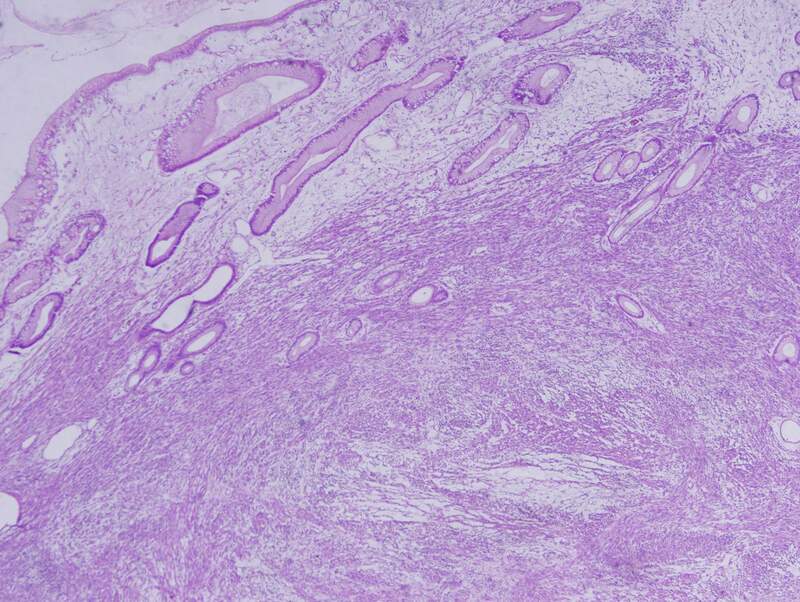 Leiomyosarcomas usually arise from the muscularis propria of the uterus and gastrointestinal tract. They account for 1% of all malignant tumors of the stomach, affecting mainly middle aged men and most commonly arising in the upper part of the body or the fundus of the stomach (Kathmandu Univ Med J 2006;4:510). Patients typically present with peptic ulcer-like symptoms, though gastric outlet obstruction may occur (BMC Res Notes 2014;7:479). Microscopically, they are composed of spindle cells with elongated nuclei and eosinophilic fibrillary cytoplasm arranged in fascicles. Prominent atypia with enlarged, hyperchromatic and pleomorphic nuclei is seen, with brisk mitotic activity and areas of necrosis (Odze and Goldblum: Surgical Pathology of the GI tract, Liver, Biliary tract, and Pancreas, 3rd ed., 2015). Across all gastrointestinal leiomyosarcomas, the 5 year survival rate is approximately 50%, and size of 5 cm or greater is a poor prognostic indicator (Histopathology 2013;63:194). 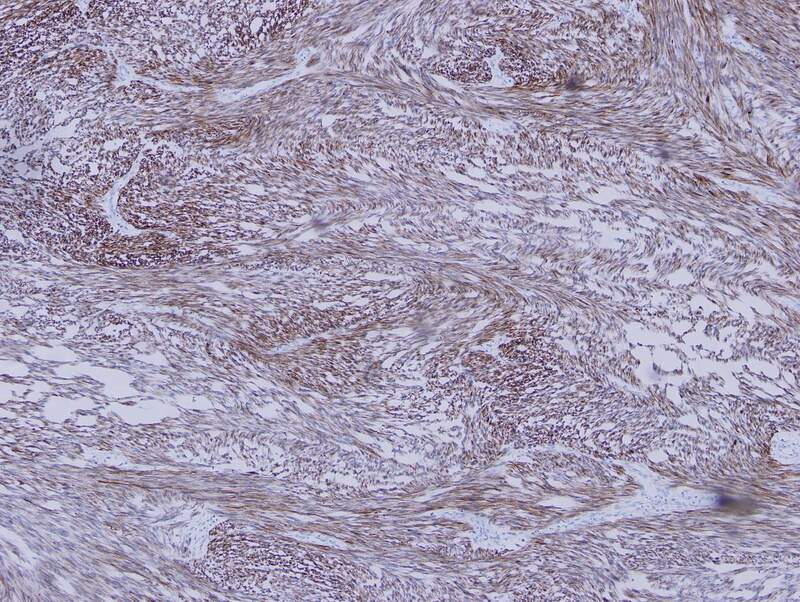 Gastric leiomyosarcoma should be distinguished from benign leiomyoma. 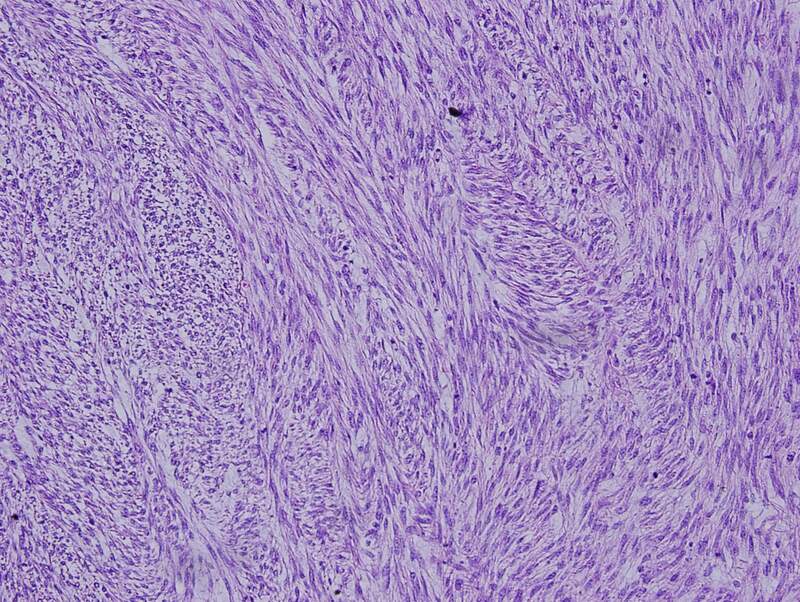 Minimal criteria for malignancy in gastrointestinal smooth muscle lesions have not been established. However, malignant features from previous retroperitoneal and intra-abdominal lesions considered to be leiomyosarcomas include a minimum mitotic rate of 1 - 4 per 10 HPFs, some degree of nuclear atypia and coagulative necrosis (Stanford Surgical Pathology Criteria). 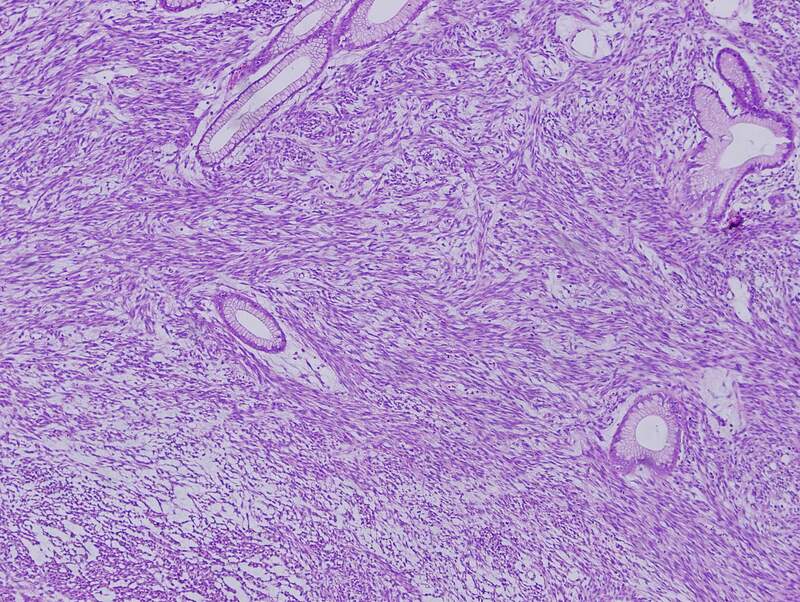 The main differential diagnosis is with gastrointestinal stromal tumor. Prior to establishment of GIST as a distinct entity, most gastrointestinal GISTs were probably diagnosed as leiomyosarcomas, meaning older research on this diagnosis may not pertain to current clinical findings and outcomes (example: Mayo Clin Proc 1992;67:533).